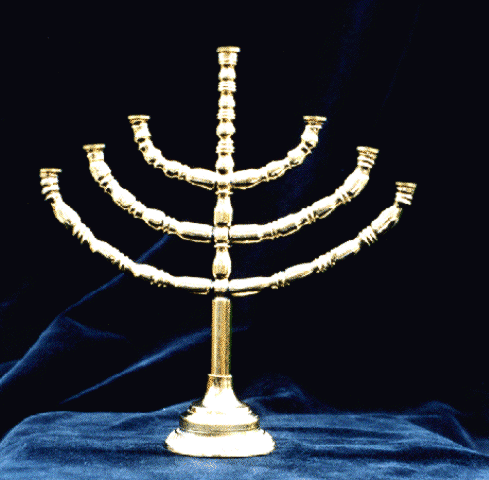 The golden candlestick or lampstand was on the southside of the Holy place. It was part of the daily services of the sanctuary. 31. And thou shalt make a candlestick of pure gold: of beaten work shall the candlestick be made: his shaft, and his branches, his bowls, his knops, and his flowers, shall be of the same. 33. Three bowls made like unto almonds, with a knop and a flower in one branch; and three bowls made like almonds in the other branch, with a knop and a flower: so in the six branches that come out of the candlestick. 34. And in the candlesticks shall be four bowls made like unto almonds, with their knops and their flowers. 35. And there shall be a knop under two branches of the same, and a knop under two branches of the same, and a knop under two branches of the same, according to the six branches that proceed out of the candlestick. 36. Their knops and their branches shall be of the same: all it shall be one beaten work of pure gold. 37. And thou shalt make the seven lamps thereof: and they shall light the lamps thereof, that they may give light over against it. 38. And the tongs thereof, and the snuffdishes thereof, shall be of pure gold. 39. Of a talent of pure gold shall he make it, with all these vessels. 40. And look that thou make them after their pattern, which was shewed thee in the mount. When John was in vision on the Isle of Patmos he saw Jesus walking amongst the golden candlestick. In John's vision of the golden candlestick it represented the seven churches depicted in Revelation chapters 2 & 3. These churches were suppose to represent the light of God.